I almost gave up on this exit. I had some real trouble finding any food close by to Perring Parkway and Putty Hill. I wasn't going to give up on this post altogether, but I was planning to lump 30A and B together. After all, I know there is food in the other direction near the K-Mart and the Home Depot. Lucky for me I passed by Taylor Avenue, down which there were some good choices for lunch. Maria's Pizzeria (map) is closest to the intersection. It is fairly difficult to miss and will be the next stop when I am out this way. Hale's Seafood (map) - Dealin' in crabs, urshturs, and the like since 1953. Really nothing else to say here. Casa Mia's (map), whose lasagna and New York-style pizza definitely have their fans. Hill's Deli and Catering (map). That's all I know about it so far. 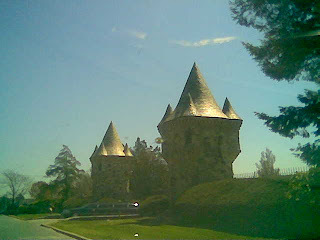 If you drive far enough, you will pass by the Moreland Memorial Cemetery, whose entrance looks like something out of the Enchanted Forest. 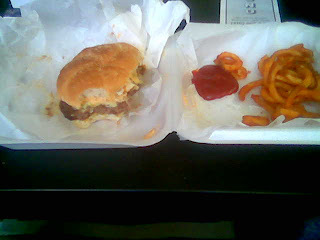 I finally stopped next door to Hale's Seafood, at Godfrey's (map), a small and simple place selling burgers (many varieties, none more than $4 with fries and small fountain drink), fifteen different varieties of wings (10 for about $7, and 30 about $17 and a quarter), ribs ($8 for 1/2 lb. ), subs (glorious subs ranging from $3.50 to $6) and sno-balls (didn't catch the price - but it is indeed that time of year). There isn't anywhere to sit inside. It's pretty much a counter with a bench for waiting. The "Big G" (their priciest, at $4.25) - has everything but the kitchen sink, apparently: "LTM" (lettuce, tomato, mushrooms - or was it mayo? ), ketchup, raw onions, jack cheese, mushrooms and bacon. This ain't health food, people. The Loyola ($3.75) - three cheeses, Swiss, Cheddar and Provolone. Mmmmmm. The Morgan State ($3.50) - Cajun spice, and that's about it. The Hawaiian ($3.95) - includes teriyaki sauce, Canadian bacon and pineapple. The Mexican ($3.95) - Monterey Jack, chili and jalapeños. Again, yum. The one I got was the Coppin State Burger, topped with almost as much as the "Big G": Thousand Island dressing, onions, pickles, Cajun spice and cheese (your choice). It came with curly fries (Arby's style; you can also get fries and Boardwalk Fries) and a small fountain drink - I got Diet Pepsi, though they also offer root beer and birch beer. Grand total: $5. Nice price. I knew it might not taste as well after 15 minutes in the car, so I had to eat some before I drove off. The burger was tasty and moist, and the toppings went nicely together. I hate to say that the Cajun spices got totally drowned out by everything else. I only remembered that it was supposed to be in there after looking back over the menu. By the time I got it home, the burger was still tasty, though a little less so after the drive back home. The fries were crispier and more flavorful than most I've had from take-out places, even though they lost their crispness on the way home. All in all, it was pretty good. Not the best burger I have had, but I'd get it again. The burger on my coffee table. Okay, I couldn't wait. I was hungry, dammit! Yes, this is a cemetery. Why does it make me want to go visit the Three Little Pigs? Would I go out of my way to eat there again? Probably not for the burger, though I would at least try a few more varieties first. Ooh...that cemetary reminds me of the Enchanted Forest! And...we used to get really good cole slaw from Hale's, but that was when I was in high school...errr...25 years ago. Might have changed a bit since then. i go by that cemetery a lot... it's creepy. so faux! Don't go to Maria's. I had to get pizzas for some volunteers at work today. I got three, what I thought were large, pizzas, but when I picked them up, they were medium. When I asked everyone how they liked the 'za, no one said anything. Then they admitted that they were not good at all. I had gotten a cheese, a meat, and a veggie pizza. They ate them all, but didn't like them, and I didn't have anything else to give them. But if you want to stay on Taylor Casa Mia's is the place to go. Hale's is now owned by Pappa's, but is best loved by the locals for the potato salad. Sweet, a little astringent, with little dots of potent flavor. Hard to stop eating, and a guaranteed win if you take it to a potluck. Coleslaw is good too. You can also get anything you see in the case fried, broiled or steamed to go or in a sandwich. Love the post, I have lived in the area for a while and found this post while I was looking for info on Godfrey's. 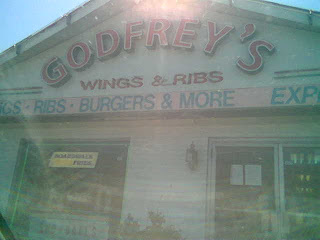 Godfrey's has really awesome ribs, the sauce is amazing. they also offer specials throughout the week, its a nice affordable place. Hales Seafood now owned by Pappa's has made some minor changes to upgrade thier establishment and has really good cream of crab soup, crab cakes are great..but I usually stop in to get some steamed shrimp...while its more expensive then the grocery store, they have found a good combination in the seasoning and the size of the shrimp is great. This might be a comment that applies to all that have been submitted so far. GOFFERY'S is now called Angel Wings. 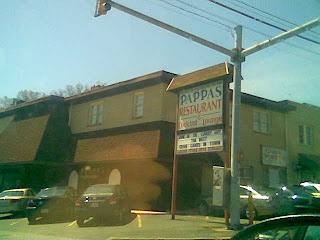 I don't know if Pappas owns it. I do know when Hales and Gofferys were around that Mr. Hale owned Goffery's. HILL'S was great. However, they no longer exsit. It is some kind of kabob store now but I can't remember the name. MARIA'S- the name is the same. I agree the pizza is not. They changed hands and I don't remember in what year but that may have been a transition period and why Pigtown - Design got such terrible service. Just a thought.